View, manage, edit, enhance, organize, tag, and share photographs. DigiKam supports import of photos from cameras, creation of albums, tagging with dates, subjects and other properties, and excellent search facilities. Please consult the manual for full details, including picture formats supported. Digikam provides advanced functionality to manage your photos. You can view your photos in chronological order, or classify the photos in different albums, there is also the possibility to organize your photos with the localization they were taken. Moreover, Digikam also provide multiple search features, you can do a simple keyword search, but also advanced search on the metadata and even some fuzzy search, where you draw a pattern and Digikam try to find matching photos. Digikam can also found duplicate in your library. Digikam can also display the Exif information of your photo. For those who find the DigiKam interface a tad too technical, ShowFoto gives access to the same tools, with a popular interface. The support page of the project has links to Frequently Asked Questions (FAQs) and to Mailing List subscription details. 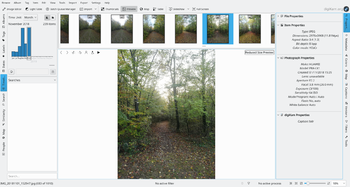 The blog Open Source Photo Processing Comes of Age by rm42 highlights developments since the KDE 3 version, and provides a useful tour. We have a growing collection of tutorials that will help you get more enjoyment and productivity from digikam. The Digikam tutorials page lists them with a brief comment on content. Click on the Photography category at the bottom of this page to see a list of all available tutorials for Digikam and Showfoto. To quickly adjust thumbnail size in the Album view, press and hold the Ctrl key, then use the mouse scroll wheel to make the thumbnails larger or smaller. With the Non-Destructive editing and Versioning feature enabled, digiKam automatically hides originals and displays the latest modified versions of the photos. For example, if you process a NEF file and save it in the JPEG format, digiKam hides the original RAW file and shows only the JPEG photo. To disable this feature, choose Settings -> Configure digiKam -> Editing Images and make sure that the Always show original images option in the In main view section is enabled. To keep things tidy, you can then group the original and all its versions. To do this, select the photos you want to group, right-click on the selection, and choose Group -> Group Selected Here. Need to quickly locate all untagged photos? In digiKam, expand the Search left sidebar, and press the Advanced Search button. In the Advanced Search window, tick the Not Tagged check box and press OK to run the search. Instead of the conventional thumbnail view, digiKam lets you map your photos on a globe. Choose View -> Map, and you should see photos from the current album mapped on the 3-D globe. 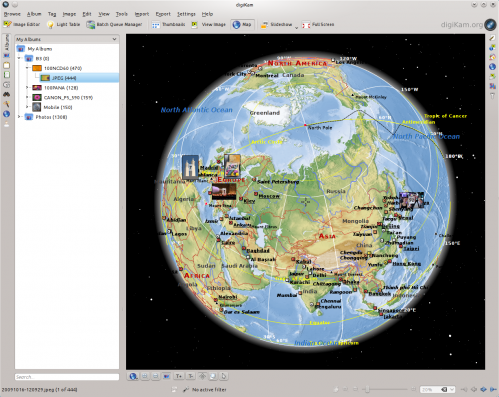 You can then use the mouse to rotate the globe and the mouse wheel to zoom in and out. Obviously, the Map view displays only geotagged photos. Digikam is available for Linux, Windows and MacOS. For Linux, you can find Digikam in your distribution repository or you can also download Digikam as an AppImage. For Windows and MacOS, you can download Digikam binary on the website download page. Beta version and source code are also available on the website download page. There is a lot of tutorials about using Digikam. These tutorials are taken from Dmitri Popov and Mohamed Malik blogs about using Digikam, and have given us permission to reproduce them. This page was last modified on 9 January 2019, at 06:09. Content is available under Creative Commons License SA 4.0 unless otherwise noted.